This article is about the mountain. For the 1960s rock band, see Mount Rushmore (band). Mount Rushmore National Memorial is a sculpture carved into the granite face of Mount Rushmore, a granite batholith formation in the Black Hills in Keystone, South Dakota, United States. Sculpted by Gutzon Borglum and his son, Lincoln Borglum, Mount Rushmore features 60-foot (18 m) sculptures of the heads of four United States presidents: George Washington (1732–1799), Thomas Jefferson (1743–1826), Theodore Roosevelt (1858–1919), and Abraham Lincoln (1809–1865). The entire memorial covers 1,278.45 acres (2.00 sq mi; 5.17 km2) and is 5,725 feet (1,745 m) above sea level. South Dakota historian Doane Robinson is credited with conceiving the idea of carving the likenesses of famous people into the Black Hills region of South Dakota in order to promote tourism in the region. Robinson’s initial idea was to sculpt the Needles; however, Gutzon Borglum rejected the Needles site because of the poor quality of the granite and strong opposition from Native American groups. They settled on the Mount Rushmore location, which also has the advantage of facing southeast for maximum sun exposure. Robinson wanted it to feature westernheroes like Lewis and Clark, Red Cloud, and Buffalo Bill Cody, but Borglum decided the sculpture should have a more national focus and chose the four presidents whose likenesses would be carved into the mountain. After securing federal funding through the enthusiastic sponsorship of “Mount Rushmore’s great political patron”, U.S. Senator Peter Norbeck, construction on the memorial began in 1927, and the presidents’ faces were completed between 1934 and 1939. Upon Gutzon Borglum’s death in March 1941, his son Lincoln Borglum took over construction. Although the initial concept called for each president to be depicted from head to waist, lack of funding forced construction to end in late October 1941. Mount Rushmore has become an iconic symbol of the United States, and has appeared in works of fiction, and has been discussed or depicted in other popular works. It attracts over two million people annually. Originally known to the Lakota Sioux as “The Six Grandfathers”, the mountain was renamed after Charles E. Rushmore, a prominent New York lawyer, during an expedition in 1885. 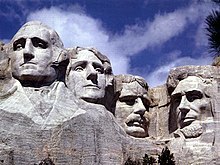 At first, the project of carving Rushmore was undertaken to increase tourism in the Black Hills region of South Dakota. After long negotiations involving a Congressional delegation and President Calvin Coolidge, the project received Congressional approval. The carving started in 1927, and ended in 1941 with no fatalities. As Six Grandfathers, the mountain was part of the route that Lakota leader Black Elk took in a spiritual journey that culminated at Black Elk Peak. Following a series of military campaigns from 1876 to 1878, the United States asserted control over the area, a claim that is still disputed on the basis of the 1868 Treaty of Fort Laramie (see section “Controversy” below). Among American settlers, the peak was known variously as Cougar Mountain, Sugarloaf Mountain, Slaughterhouse Mountain, and Keystone Cliffs. It was named Mount Rushmore during a prospecting expedition by Charles Rushmore, David Swanzey (husband of Carrie Ingalls), and Bill Challis. The original plan was to perform the carvings in granite pillars known as the Needles. However, Borglum realized that the eroded Needles were too thin to support sculpting. He chose Mount Rushmore, a grander location, partly because it faced southeast and enjoyed maximum exposure to the sun. Borglum said upon seeing Mount Rushmore, “America will march along that skyline.” Congress authorized the Mount Rushmore National Memorial Commission on March 3, 1925. President Coolidge insisted that, along with Washington, two Republicans and one Democrat be portrayed. Between October 4, 1927, and October 31, 1941, Gutzon Borglum and 400 workers sculpted the colossal 60 foot (18 m) high carvings of U.S. presidents George Washington, Thomas Jefferson, Theodore Roosevelt, and Abraham Lincoln to represent the first 130 years of American history. These presidents were selected by Borglum because of their role in preserving the Republic and expanding its territory. The carving of Mount Rushmore involved the use of dynamite, followed by the process of “honeycombing”, a process where workers drill holes close together, allowing small pieces to be removed by hand. In total, about 450,000 short tons (410,000 t) of rock were blasted off the mountainside. The image of Thomas Jefferson was originally intended to appear in the area at Washington’s right, but after the work there was begun, the rock was found to be unsuitable, so the work on the Jefferson figure was dynamited, and a new figure was sculpted to Washington’s left. The Sculptor’s Studio — a display of unique plaster models and tools related to the sculpting — was built in 1939 under the direction of Borglum. Borglum died from an embolism in March 1941. His son, Lincoln Borglum, continued the project. Originally, it was planned that the figures would be carved from head to waist, but insufficient funding forced the carving to end. Borglum had also planned a massive panel in the shape of the Louisiana Purchase commemorating in eight-foot-tall gilded letters the Declaration of Independence, U.S. Constitution, Louisiana Purchase, and seven other territorial acquisitions from Alaska to Texas to the Panama Canal Zone. In total, the entire project cost US$989,992.32. Unusually for a project of such size, no workers died during the carving. Aerial NW direction view of Mount Rushmore National Memorial from a helicopter. The flora and fauna of Mount Rushmore are similar to those of the rest of the Black Hills region of South Dakota. Birds including the turkey vulture, bald eagle, hawk, and meadowlark fly around Mount Rushmore, occasionally making nesting spots in the ledges of the mountain. Smaller birds, including songbirds, nuthatches, and woodpeckers, inhabit the surrounding pine forests. Terrestrial mammals include the mouse, least chipmunk, red squirrel, skunk, porcupine, raccoon, beaver, badger, coyote, bighorn sheep, bobcat, elk, mule deer, yellow-bellied marmot, and American bison. The striped chorus frog, western chorus frog, and northern leopard frogalso inhabit the area, along with several species of snake. Grizzly Bear Brook and Starling Basin Brook, the two streams in the memorial, support fish such as the longnose dace and the brook trout. Mountain goats are not indigenous to the region. Those living near Mount Rushmore are descendents of a tribe that Canada gifted to Custer State Park in 1924, which later escaped. A study of the fire scars present in tree ring samples indicates that forest fires occur in the ponderosa forests surrounding Mount Rushmore around every 27 years. Large fires are not common. Most events have been ground fires that serve to clear forest debris. The area is a climax community. Recent[when?] pine beetleinfestations have threatened the forest. Mount Rushmore is largely composed of granite. The memorial is carved on the northwest margin of the Black Elk Peakgranite batholith in the Black Hills of South Dakota, so the geologic formations of the heart of the Black Hills region are also evident at Mount Rushmore. The batholith magma intruded into the pre-existing mica schist rocks during the Proterozoic, 1.6 billion years ago. Coarse grained pegmatite dikes are associated with the granite intrusion of Black Elk Peak and are visibly lighter in color, thus explaining the light-colored streaks on the foreheads of the presidents. The Black Hills granites were exposed to erosion during the Neoproterozoic, but were later buried by sandstone and other sediments during the Cambrian. Remaining buried throughout the Paleozoic, they were re-exposed again during the Laramide orogeny around 70 million years ago. 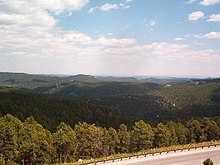 The Black Hills area was uplifted as an elongated geologic dome.Subsequent erosion stripped the granite of the overlying sediments and the softer adjacent schist. Some schist does remain and can be seen as the darker material just below the sculpture of Washington. 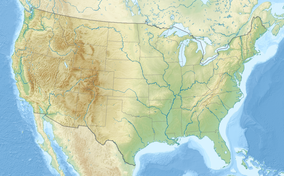 The tallest mountain in the region is Black Elk Peak (7,242 ft or 2,207 m). Borglum selected Mount Rushmore as the site for several reasons. The rock of the mountain is composed of smooth, fine-grained granite. The durable granite erodes only 1 inch (25 mm) every 10,000 years, thus was more than sturdy enough to support the sculpture and its long-term exposure. The mountain’s height of 5,725 feet (1,745 m) above sea level made it suitable, and because it faces the southeast, the workers also had the advantage of sunlight for most of the day. The Mount Rushmore area is underlain by brown to dark grayish brown, well drained alfisol soils of very gravelly loam (Mocmount) to silt loam (Buska) texture. Mount Rushmore has a humid continental climate (Dwb in the Koeppen climate classification). It is inside a USDA Plant Hardiness Zone of 5a, meaning certain plant life in the area can withstand a low temperature of no less than −20 °F (−29 °C). Tourism is South Dakota’s second-largest industry, and Mount Rushmore is the state’s top tourist attraction. In 2012, 2,185,447 people visited the park. In the 1950s and 1960s, Siouxan Benjamin Black Elk was the “Fifth Face of Mount Rushmore”, posing for photographs with thousands of tourists. He became one of the most photographed people in the world. Laser scan data showing Abraham Lincoln. The ongoing conservation of the site is overseen by the US National Park Service. Physical efforts to conserve the monument have included replacement of the sealant applied originally by Gutzon Borglum, which had proved ineffective at providing water resistance (components include linseed oil, granite dust and white lead). A modern silicone replacement was used, disguised with granite dust. In 1998, electronic monitoring devices were installed to track movement in the topology of the sculpture to an accuracy of 3 mm. The site has been subsequently digitally recorded using a terrestrial laser scanning methodology in 2009 as part of the international Scottish Ten project, providing a record of unprecedented resolution and accuracy to inform the conservation of the site. This data was made accessible online to be freely used by the wider community to aid further interpretation and public access. The Crazy Horse Memorial is being constructed elsewhere in the Black Hills to commemorate the famous Native American leader as a response to Mount Rushmore. It is intended to be larger than Mount Rushmore and has the support of Lakota chiefs; the Crazy Horse Memorial Foundation has rejected offers of federal funds. However, this memorial is likewise the subject of controversy, even within the Native American community. Because of its fame as a monument, Mount Rushmore has been depicted in multiple places in popular culture. It is often depicted as a cover for a secret location; shown with faces removed or modified (as in Superman II), or added; or parodied. The memorial was also famously used as the location of the climactic chase scene in Alfred Hitchcock‘s 1959 movie North by Northwest. Mount Rushmore is portrayed as the site of Cibola, a mythical city of gold, in the 2007 film National Treasure: Book of Secrets. On August 11, 1952, the U.S. Post Office issued the Mount Rushmore Memorial commemorative stamp on the 25th anniversary of the dedication of the Mt. Rushmore National Memorial in the Black Hills of South Dakota. On January 2, 1974, a 26-cents airmail stamp depicting the monument was also issued. ^ Jump up to:a b c d “Park Statistics”. National Park Service. Retrieved January 4, 2014. Jump up^ Mount Rushmore National Memorial. December 6, 2005.60 SD Web Traveler, Inc. Retrieved April 7, 2006. Jump up^ McGeveran, William A. Jr. et al. (2004). The World Almanac and Book of Facts 2004. New York: World Almanac Education Group, Inc. ISBN 0-88687-910-8. ^ Jump up to:a b Mount Rushmore, South Dakota (November 1, 2004). Peakbagger.com. Retrieved March 13, 2006. Jump up^ “Making Mount Rushmore | Mount Rushmore”. Oh, Ranger!. Retrieved October 31, 2012. Jump up^ “Biography:Senator Peter Norbeck”. American Experience: Mount Rushmore. PBS. Retrieved July 20, 2013. Jump up^ “Mount Rushmore”. American Experience – TV’s Most Watched History Series. PBS. Retrieved 18 April 2015. Jump up^ Belanger, Ian A.; Kennedy, Sally; Allison; McMeen, Melissa; Arnold, John (April 21, 2002). “Mt. Rushmore — presidents on the rocks”. Archived from the original on May 14, 2006. Retrieved January 11, 2016. Jump up^ “Mount Rushmore National Memorial Frequently Asked Questions”. National Park Service. Retrieved December 2, 2009. Jump up^ Keystone Area Historical Society Keystone Characters. Retrieved October 3, 2006. Jump up^ “People & Events: The Carving of Stone Mountain”. American Experience. PBS. Retrieved March 17, 2010. ^ Jump up to:a b c d e Carving History (October 2, 2004). National Park Service. Jump up^ Fite, Gilbert C. Mount Rushmore (May 2003). ISBN 0-9646798-5-X, the standard scholarly study. Jump up^ “Carving History”. National Park Service. Retrieved February 22, 2013. ^ Jump up to:a b Albert Boime, “Patriarchy Fixed in Stone: Gutzon Borglum’s ‘Mount Rushmore’,” American Art, Vol. 5, No. 1/2. (Winter – Spring, 1991), pp. 142–67. Jump up^ “Honeycombing process explained from”. nps.gov. June 14, 2004. Archived from the original on August 1, 2008. Retrieved March 20, 2010. Jump up^ “Geology Fieldnotes”. nps.gov. January 4, 2005. Retrieved October 22, 2010. ^ Jump up to:a b American Experience “Timeline: Mount Rushmore” (2002). Retrieved March 20, 2006. Jump up^ Mount Rushmore National Memorial. Jump up^ Mount Rushmore National Memorial. Tourism in South Dakota. Laura R. Ahmann. Retrieved March 19, 2006. Jump up^ Mount Rushmore National Memorial. Outdoorplaces.com. Retrieved June 7, 2006. Jump up^ “Text of 1934 Essay – History of the United States” (PDF). Jump up^ “George Bush: Remarks at the Dedication Ceremony of the Mount Rushmore National Memorial in South Dakota”. The American Presidency Project. July 3, 1991. Retrieved November 1, 2012. Jump up^ “Hall of Records”. Mount Rushmore National Memorial web site. National Park Service. June 14, 2004. Archived from the original on October 11, 2007. Retrieved July 4, 2007. Jump up^ “For Mount Rushmore, An Overdue Face Wash”. Washington Post. July 11, 2005. Retrieved March 17, 2010. ^ Jump up to:a b c “Enjoy Wildlife……Safely.” (PDF). National Park Service. National Park Service. Retrieved January 4, 2014. ^ Jump up to:a b Freeman, Mary. “Mount Rushmore, South Dakota for Tourists”. USA Today. Tysons Corner, VA: Gannett Company. Retrieved January 3, 2014. Jump up^ “Amphibians”. National Park Service. National Park Service. Retrieved January 4, 2014. Jump up^ “Nature & Science- Animals”. NPS. November 26, 2006. Retrieved March 17,2010. ^ Jump up to:a b “Mount Rushmore- Flora and Fauna”. American Park Network. 2001. Archived from the original on December 12, 2007. Retrieved January 11, 2016. Jump up^ “Nature & Science – Plants”. NPS. December 6, 2006. Retrieved March 17,2010. Jump up^ Nature & Science- Groundwater. National Park Service. Retrieved April 1, 2006. Jump up^ Nature & Science- Forests. National Park Service. Retrieved April 1, 2006. ^ Jump up to:a b Geologic Activity. National Park Service. Jump up^ Irvin, James R. Great Plains Gallery (2001). Retrieved March 16, 2006. Jump up^ “USDA Hardiness Zone Finder”. The National Gardening Association. National Gardening Association. Retrieved January 3, 2014. Jump up^ “Weather History”. National Park Service, U.S. Department of the Interior. June 23, 2004. Archived from the original on July 6, 2008. Retrieved January 27,2013. Jump up^ “Monthly Averages for Mount Rushmore Natl Memorial, SD”. The Weather Channel. Retrieved January 3, 2014. Jump up^ “NOWData – NOAA Online Weather Data”. National Oceanic and Atmospheric Administration. Retrieved January 3, 2014. Jump up^ “Popular South Dakota Attractions >>South Dakota”. southdakota.com. Retrieved March 21, 2015. Jump up^ Kilen Ode, Jeanne (1984). South Dakota History. 14. South Dakota Historical Society Press. Jump up^ “Caring For A Monumental Sculpture” (PDF). National Park Service. Retrieved July 8, 2013. Jump up^ “Mount Rushmore National Memorial”. CyArk. Retrieved July 8, 2013. Jump up^ Matthew Glass, “Producing Patriotic Inspiration at Mount Rushmore,” Journal of the American Academy of Religion, Vol. 62, No. 2. (Summer, 1994), pp. 265–283. Jump up^ David Melmer (December 13, 2004). “Historic changes for Mount Rushmore”. Indiancountrytoday. Archived from the original on August 8, 2010. Retrieved March 17, 2010. Jump up^ “3c Mt. Rushmore single”. Smithsonian National Postal Museum. Retrieved July 1, 2014. Jump up^ Scotts United States Stamp catalogue, 1982. Scott’s Publishing Company. 1981. ISBN 0-89487-042-4. , p. 289. “Making Mount Rushmore”. Oh, Ranger!. APN Media. Retrieved January 27, 2013. Dobrzynski, Judith H. (July 15, 2006). “A Monumental Achievement”. Wall Street Journal. Retrieved January 27, 2013. Buckingham, Matthew (Summer 2002). “The Six Grandfathers, Paha Sapa, in the Year 502,002 C.E.”. Cabinet Magazine. Immaterial Incorporated. Retrieved January 27, 2013. “Luigi Del Bianco: chief stone carver on Mount Rushmore, 1933–1940”. Lou Del Bianco. Retrieved January 27, 2013. “Caring For A Monumental Sculpture” (PDF). National Park Service. Retrieved July 8, 2013.